At the price, we reckon Vox’s AV30 is a real steal. Loads of fun to use. 2017 is a significant year for Vox, marking 60 years of amp production and 25 years of since Korg became its current custodian. Today, Vox makes amps to cover practically every need, from sophisticated modelling amps to hand-wired replicas of its most famous valve models from the early 1960s. Sitting roughly in the middle of these two extremes is one of Vox’s most interesting designs, the hybrid AV (Analog Valve) series, which combines analogue solid-state and valves, together with digital effects for a unique blend of features and tones. There are three models: the 1x8 AV15 combo, the 1x12 AV60 combo and this, the 1x10 AV30. The first thing to know about the AV30 is that it isn’t programmable - there are two ‘what you see is what you get’ channels with identical voice selection, gain and tone controls, feeding an analogue-voiced digital effects section. The AV30 has enough range to conjure up some truly excellent tones. Two 12AX7 dual-triode valves work in the preamp and Vox’s clever Valve Reactor output stage, with switches that let you tinker with tone and output stage response. 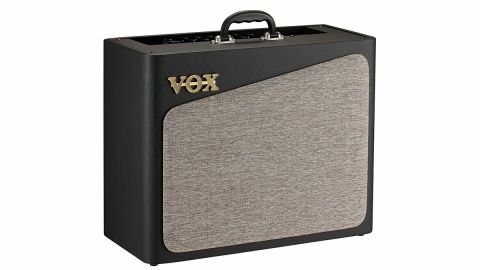 Voice selections cover most popular amp tones, including well-known American vintage combos in the Clean 1 and 2 slots, while Crunch 1 & 2 are occupied by Vox’s AC15 and AC30. The OD1 and OD2 voices are inspired by classic rock heads from the 70s and 80s, while Hi Gain 1 and 2 bring us up to date with modern metal tones. In short, something for everyone, wrapped up in a retro-modern cabinet that’s designed to enhance the AV’s acoustic properties and maximise projection. In use, the AV30 is fun and inspiring, with very playable tones that flatter humbuckers and single coils, responding with the bounce and squash of a real all-valve circuit. The basic amp sounds cover every need, from country twang, Britpop and blues through to classic rock and modern metal, with expanded range for detuned guitars, all enhanced by the AV’s built-in effects. What it lacks in programmability, the AV30 more than makes up for in sound quality, with a tonal depth that many digital modelling designs will find hard to match, and plenty of volume to handle small to medium un-mic’d gigs. It’s great to noodle through endless presets, but you’ll often find that two good sounds are all you need, and the AV30 has enough range to conjure up some truly excellent ones that practically everyone will enjoy, from classic 60s cleans to seven-string filth, with excellent projection and portability.